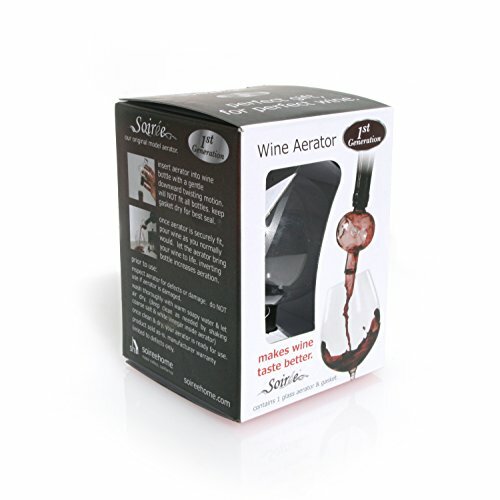 Hand-blown glass wine aerator that comes with one silicone gasket that will fit standard wine bottles. Simple to use. And enhances the flavor of almost every wine, Red & White. Not only is cute and always the talk of the table. Soiree is also a great gift for wine lovers or host gifts. Does NOT include drying stand. Glass Wine Aerator. Fits most wine bottles. Makes Wine Taste Better instantly as you pour, red & white wines. Awesome gift for wine lovers, party or hostess gift. stocking stuffer. 1st Generation model does NOT INCLUDE: drying stand or Warranty. If you have any questions about this product by Soireehome, contact us by completing and submitting the form below. If you are looking for a specif part number, please include it with your message.